The word "yi" ("meaning", "significance") in a melody title suggests that the "yi" is short for "diaoyi" ("meaning of the mode" but more generally "modal prelude"), and that the melody is intended to reveal something essential about the mode itself, whether musically, thematically or otherwise. These diao yi are usually called modal preludes because many of them seem clearly designed to go either with specific longer pieces, or groups of pieces in that mode. This custom seems mostly to have disappeared in the Qing dynasty but it was very common during the Ming. In the present handbook the preludes do not seem to be associated with specific melodies. Instead Luqi Xinsheng puts all of its five modal preludes together at the front of its melody section. Through the titles and by including musical motifs from the related existing modal preludes, as well as by using lyrics with themes often associated with these modes, it suggests that, although these songs are independent, each one conveys something essential about that mode. In addition, although these five span the five standard tuning modes, the handbook itself uses only two of these modes, gong (one piece) and shang (five pieces); the rest use non-standard tuning, for which the handbook gives no modal preludes. Add to this the style of the present melody and it seems most likely these five modal preludes were intended to function as independent songs. Lu Qi Xin Sheng itself has one melody in gong mode, Meihua Sannong but there does not seem any particularly connection between these two. On the other hand, with its open string beginning and its lyrics, the present "Gong Yi" does work very nicely well as a prelude for the 1525 Yang Chun (note also its section titles).4 Perhaps this means no more than that Yang Chun was an archetypal gong mode melody both modally and thematically. It does, however, also suggest that the repertoire of Xu Nanshan was not limited to the pieces in his handbook. her face and the peach blossoms reflected each other's red allure. but the peach blossoms still smile in the spring breeze as of yore. A largely syllabic setting. Lau Shing Hon, who kindly translated the lyrics, adds, "Birds and flowers in bloom can allude to lovely ladies, but these verses are also open to other interpretations, such as if considered from the viewpoint of a lonely lady in a beautiful court yard filled with the emotions of spring and love, yet with only birds to whom she can offer these emotions." Zǐ mò qīng mén rén xián qiǎn quǎn. A purple flowered lane to a green door: be entwined in tender affection. Fāng cǎo rèn liú liàn. The fragrant grass is plenty for laying with love. Gōng zǐ wáng sūn, xì wǔ qiū qiān. Young lords and princes, gambol around a swing. Guò hóng xìng dī biān. Passing ripe apricots along the dyke. Dàn yún qīng yān, chèn cǐ fāng chén. With thinning clouds and light haze: seize this wonderful time! Huā chā mào yán, hóng xiāng yìng yǎn, táo huā rén miàn. With flowers stuck in hat brims, reds mutually reflect in peach blossom pretty faces. Yàn zi guī lái tíng yuàn. As swallows return to the court yard. Mò xī zhàng tóu qián. So don't be miserable about spending ready cash (for wine or love). Or listen next to the 1525 Yang Chun. For more on gong mode see Shenpin Gong Yi. For modes in general see Modality in Early Ming Qin Tablature. In 1525, as in Shen Qi Mi Pu and several other handbooks, there are many pieces that are actually part of a set of three: modal prelude, short melody, then main melody. This is true of the handbook's Yang Chun, with is preceded by a gong modal prelude and then the melody Xiuxi Yin, related to a spring ceremony involving the drinking of wine. To me, however, these seem less specific to Yang Chun, perhaps even working better in connection with #12 Liu Shang. 5. Spring and love: and wine? Many phrases in the present Gong Yi can be found in "嗜皇忌 Shi Huang Ji" ("Enjoying the imperially restricted? 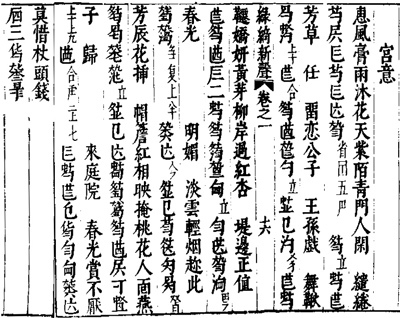 ), one section of the anonymous and undated work "讀「北山酒經」客談" (Chat on Reading the North Mountain Wine Classic; ctext.org reprinted the text using optical scanning from the original, which presumably had no punctuation). The phrases include, "沐花夭", "紫陌青門人", "公子王孫戲舞獻", "柳岸過紅杏堤邊", "桃花人面", "歸來庭" and "紅相映掩". The same text also uses lyrics found in other modal preludes, perhaps copied from the 1597 handbook. I have not yet worked out the significance of this. Although I have not yet found further information about "讀「北山酒經」客談 Chat on Reading the North Mountain Wine Classic", there is further information on various actual Wine Clasics. According to http://www.chinaknowledge.de/Literature/Science/jiujing.html there are several books or articles with 酒經 Jiu Jing in or as the title. The largest is 朱翼中，北山酒經 Zhu Yizhong's Beishan Jiu Jing (Song dynasty). Another one, also Song dynasty, is the Jiu Jing of Su Shi (Su Dongpo). Su Shi's book, also known as 東坡酒經 Dongpo Jiu Jing, quite short, briefly speaks of various themes such as the production of predried yeast (bing 餅) or fresh ferments (qu 麯) and the process of fermenting wine. Another Song dynasty work is the supplement by 李保 Li Bao called 續北山酒經 Xu Beishan Jiu Jing. 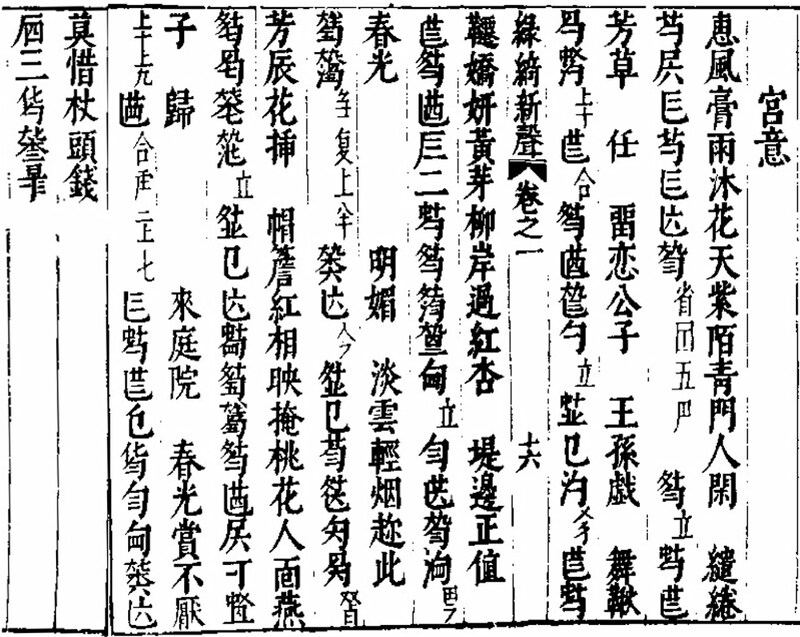 This famous poem was part of a story attributed to Cui Hu called 人面桃花 Renmian Taohua. There are now various versions of this story, as can be found from a net search for "Cui Hu" and "poet". There were also several operas based on this story, including the 傳奇 Chuanqi opera A Predestined Affinity with Peach Blossoms (桃花緣 Taohua Yuan) and the 崑曲 Kunqu opera Romance of the Peach Blossoms (桃花記 Taohua Ji). However, there is little else about 崔護 Cui Hu himself other than that he lived around 800 CE. 81字, but it does not seem to folllow any ci pattern.